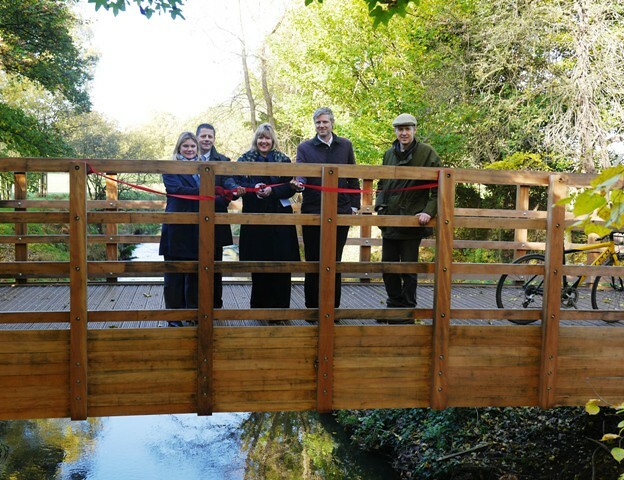 A new shared-use pathway and bridge for pedestrians and cyclists was officially opened in Richmond Park today at an event attended by Rt Hon Justine Greening, MP and Zac Goldsmith, MP. The almost mile-long additional pathway will take people off the busy A3 and provide an excellent connection to the park from the East. The path runs from Robin Hood Gate, where an award-winning Greenway scheme was implemented in 2010, to Chohole Gate, along the side of the Richmond Park Golf course, parallel to the A3. The pathway and bridge is open to both walkers and cyclists during the opening hours of the Park, and the surface quality is also suitable for wheelchairs and pushchairs. The ribbon cutting ceremony took place on the bridge over the Beverley Brook, a particularly attractive feature of the route. In 2012/13 Transport for London (TfL) contributed £215,000 from the Cycle on Greenways programme to deliver the Beverley Brook Bridge and shared use path. In partnership with the Royal Parks and other delivery partners TfL has delivered over 400km of quiet walking and cycling Greenways routes across London. The Mayor's Vision for Cycling recognises the success of this network through the promotion of a new, enhanced programme of Quietways; high quality cycle routes running through low-trafficked side streets, parks and other green spaces and alongside waterways. Existing Greenways will form part of the Quietways network and will enable and encourage more people to cycle more often. "The new Beverley Brook Bridge and shared use path provides an excellent new connection to Richmond Park, and perhaps most importantly, takes people off the busy A3 to support safe cycling. The legacy of London 2012 is that more cyclists are now using Richmond Park, and indeed all the Royal Parks and this is one of the more significant projects delivered out of the £4.5million spent on cycle infrastructure in the parks since 2007." "A growing number of people are using London's network of quiet walking and cycling routes so we welcome and support the Royal Parks in providing new facilities such as Beverley Brook Bridge and Path. This route will give cyclists of all ages and abilities an alternative to the busy A3 and will help to achieve the aspirations set out in the Mayor's Vision for Cycling. The investment in new Quietways will allow us to work with the Royal Parks and other partners to build on all that has been done so far by offering a wider and better connected network of safe and quiet routes." The Royal Parks, Transport for London and other delivery partners are delivering new and improved cycle routes and facilities as part of the Mayor's Vision for Cycling. The Vision has set out an ambitious £900+ million plan over 10 years to get more people travelling by bike; the Quietways network will play a key role in achieving this vision.